So I survived a year by myself. I didn't get a lot of study done, I had a rough time, etc., but here I am: in Gympie, with my husband, embarking on a new adventure of sorts. I'm slack with studies, and I have slowly learned over time to put attitudes and processes in place at the beginning of things to make it last or work better. Students should do the same. I make a point of owning up to past behaviours that lead me to a better way of doing things, because if I'm going to learn from mistakes, I like giving others a chance to learn from mine also (though generally we all need to make our own mistakes to really get the hang of things). You want to maintain your achievements from last year? You want to leave your old attitude behind and start fresh? You want to keep improving after finally making progress last year? You want to get your parents/teachers to stop giving you a hard time? You need to want to be the best you; not best student, not best child, the best you. Here's my advice, cobbled together from internet readings, personal experience, observations and whatever else is bouncing around in my head. I have a lot of tutees who have expressed wanting to change classes purely because of the teacher they've been assigned. I am not denying that some teaching styles don't work for everyone, and that not clicking with a teacher can make a class much more difficult, but often it comes down to a matter of respect. I often refer to skills or processes as 'tools', especially in Maths. There is a drawer in the toolbox for the algebra tools, and a draw for all the financial maths tools, there's a couple of tools for essay structure, there are a few for test preparation, and sometimes you use more than one drawer at a time. The most valuable tool for learning (and also for just being a human being) is self-awareness. This sometimes gets the fancy term 'metacognition', and the tutees I work with who succeed and/or improve, they exhibit this. Why do you do the things you do? Why are you acting up in that particular class? What's similar about the questions you continue to get wrong? What habit is playing out when writing paragraphs that don't read well? What usually happens when I do this sort of question? Have I actually changed or improved at something? What skills do you already have? What are the specific skills you need? Why do you feel the way you do about Maths, Science, Humanities? There is always something under the surface, and very little of our actions and habits are random, the key is look beneath the surface and take responsibility for your actions and abilities, and take credit for what you achieve. I never used to use a diary. I'd set up my teacher ITC diary at the start of the school year, filling it with lots of good intentions, and then half way through first term it was relegated to the bottom of the pile of papers on my desk. Not everyone is good at it, but now that I've developed my own style of diary keeping, I don't know how I ever lived without it. Most schools have their own diary available (though one school, which many of my Bundaberg tutees attend, has gone full digital much to the chagrin of many of said tutees), and it will have a lot of useful things already in there: public holidays, term dates, pupil free days, school rules etc. Writing down when your assessment is due, keeping track of homework, putting in events outside of school that might hinder or clash with school committments, it's wort it. Need more writing space? : get a week to a view or day to a page. Keep losing or destroying your diary? : use one on your laptop or other school approved device. Think diaries are lame and for nerds? : get over yourself, school is important and good for you. Structure helps us, it gives us direction and keeps us grounded, it's a ladder to stand on, it's a frame display our needs, metaphor metaphor something something use a diary. Heck, I'll help you set up one or design one for you if you need it. Once the school year starts, stuff will happen, and you'll get task sheets and homework and readings and library books and everything. It's a lot, and it's harder than last year. When it comes to assignments, test preparation, stuff and things, it all whirls together into a giant storm in your head and you may feel like it's too much to handle and too impossible to deal with. So write it down. Everything is big and scary while it's amorphous in your head, writing down the different steps of a task that seems too big or even not big, makes it smaller. Each step is stuck to the page and out of your head, leaving more room in your head to actually do those tasks. 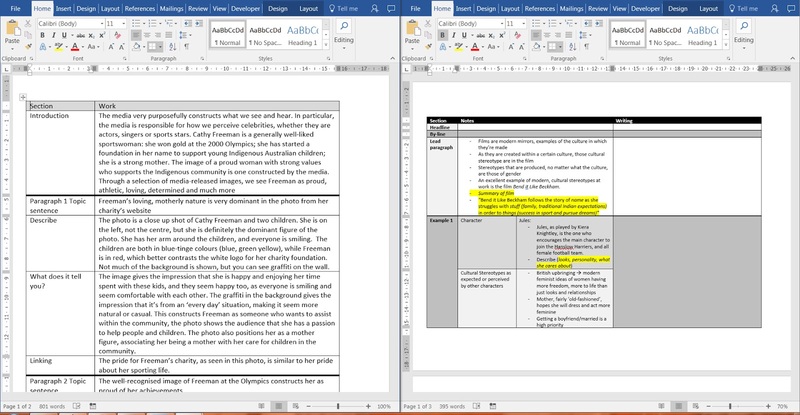 Multistage assignments suddenly seem a lot less scary when they're written down, and it puts you back in control. Break down an assignment into smaller parts, organise it in a table, whatever works, but trust me, it has helped so many students and tutees I've worked with. Take that you essay you, you're not so scary when you're broken down into 150 words chunks now are ya? "I was so rubbish last year, I kept getting in trouble. I was sick and stuff, and that teacher didn't like me, but I can do better. I'm going to do everything better, completely transform myself into the ultimate student. I can do anything!" Then fast forward about a month, nothing has changed, and they feel deflated, like they've failed, like they must just be a rubbish student and there's nothing they can do about it. Don't change everything at once. I have only just started to be aware of my penchant to make big claims and big plans and then not follow through. It's easy to get excited; it's difficult to be consistent. Write something down in every single lesson, doesn't need to be a lot, but always write something down. Ask a question/ask for help a minimum number of times per week in a subject you know you struggle with. Schedule weekend time for doing school work, especially around assignment time. Sit in a different spot in a class to help be more focussed, or to at least avoid the distraction of friends that you are going to see at lunch time anyway. Outside of brain chemistry, legitimate disorders and physical ability, you are in charge of your success. You need to take responsibility and you are the one who make you the best you. You can ask for help, you can make mistakes, you can have bad days, you can have good luck, all of that, it's all completely fine, but note that all of those have 'you' in it. You've got to be in it.